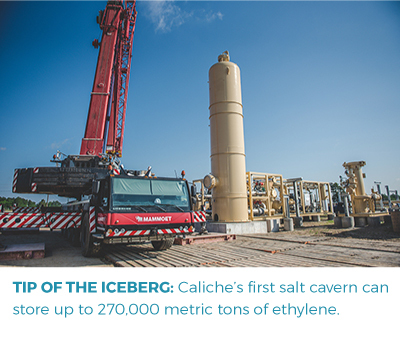 November 26, 2018 | Clay Boswell (Chemical Week) – Caliche Development Partners (Houston, Texas) has brought into service a 5-million bbl (MMb) salt cavern at Beaumont, Texas, that will be used to store up to 600 million lbs (270,000 metric tons) of ethylene. The company continues to build out a 5-MMb ethane cavern that will go online during the fourth quarter of 2019, and it is drilling a 3-MMb ethane cavern slated for start-up during the first quarter of 2020. Caliche has permits in hand for five more, which will be drilled and configured to meet the emerging needs of US Gulf Coast ethylene producers, says Dave Marchese, CEO. Caliche was formed in 2016 as a storage platform investment for its partner, Energy Spectrum Partners, a ded-icated midstream private equity firm. “We saw the development and construction of all these ethane crackers, and we were not seeing the equivalent storage being built,” Marchese says. “So we looked for assets to both develop and acquire, and in May 2017, we bought this site from Vitol.” Vitol had permits to build eight caverns at the 53-acre site, which is located 4 miles south of Beaumont and 52 miles east of Mont Belvieu, Texas. The company completed one cavern before shelving the project in 2013. “We immediately started construction of the balance of the facilities, talked to pipelines in the area to work on tie-ins, worked with our customers, and built it up,” says Marchese. The ethylene cavern connects to a 13-mile header system crossing five operating ethylene pipelines, at least three of which will be connected to the facility by the end of this year. It is partially contracted, and Marchese expects the bulk of contracts to be completed before January. The ethylene cavern provides several benefits to producers, says Marchese.